WELCOME TO PRECEPT MINISTRIES HONG KONG. We're here to help you dig deeper into God’s Word, simply and easily; to help you experience God speaking to you clearly, personally; to help you understand the width and depth of Jesus’ love for you... and through the power of the Holy Spirit, to help you transform your life. Precept Ministries is privileged to minister to people in Hong Kong, teaching them to study God's Word inductively. If there is not a group currently in your area, you may wish to consider starting a small group of your own. 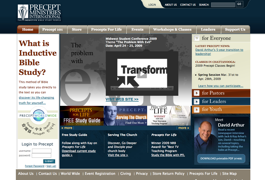 Precept materials are designed to make it easy for you to lead a group.